I almost forgot to post this cake and I think you’ll enjoy looking at it.I think most people are familiar with The Cat in the Hat books by Dr. Seuss. 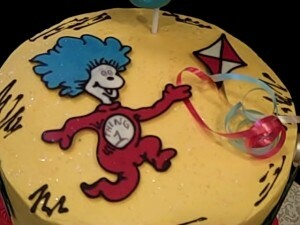 Well, this cake is about Thing 1 & Thing 2 and in case you don’t know them here they are. I don’t really remember reading the books when I was a little girl, but now that I have my children I’m finally familiar with them. They even have the books in Spanish! 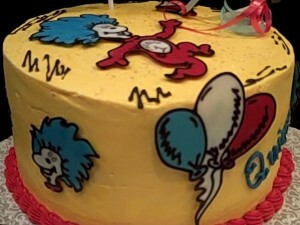 The story on the cake is about a couple of little ones celebrating their birthday, I believe on the same day (if not only days close). 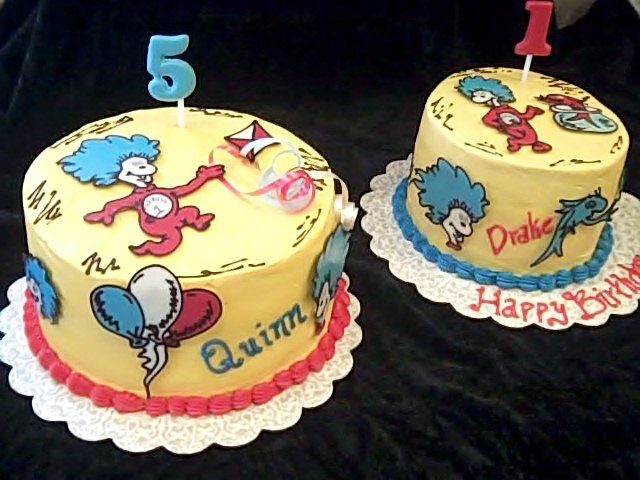 My client liked a pair of matching cakes I had made in the past on Monster’s Inc. where one is bigger than the other one. So this Dr. Seuss cake is bases on that idea. 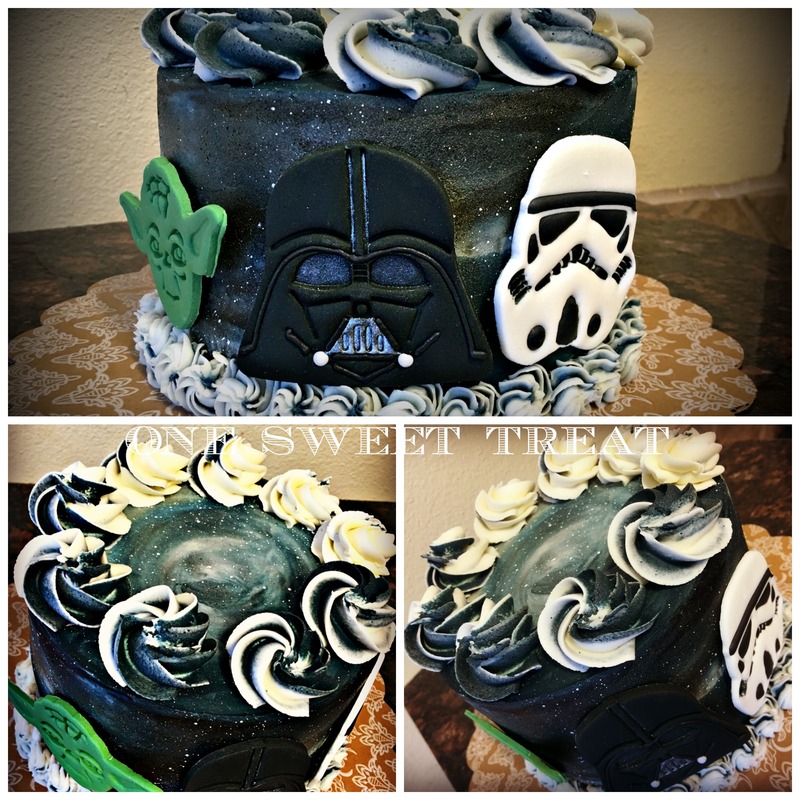 Here’s the cake for 2 boys, one turning 5 years old and the other one celebrating his 1st birthday. There’s a lot of details to show on the cakes. 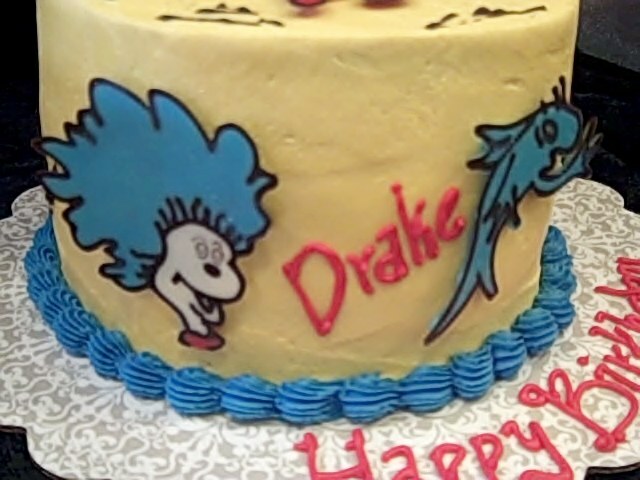 Here’s Thing 2 designed for Drake, the little brother. Thing 1 went to Quinn, the older brother. Here are some of the details on the cakes. You have balloons, popular faces and that always worried looking fish. 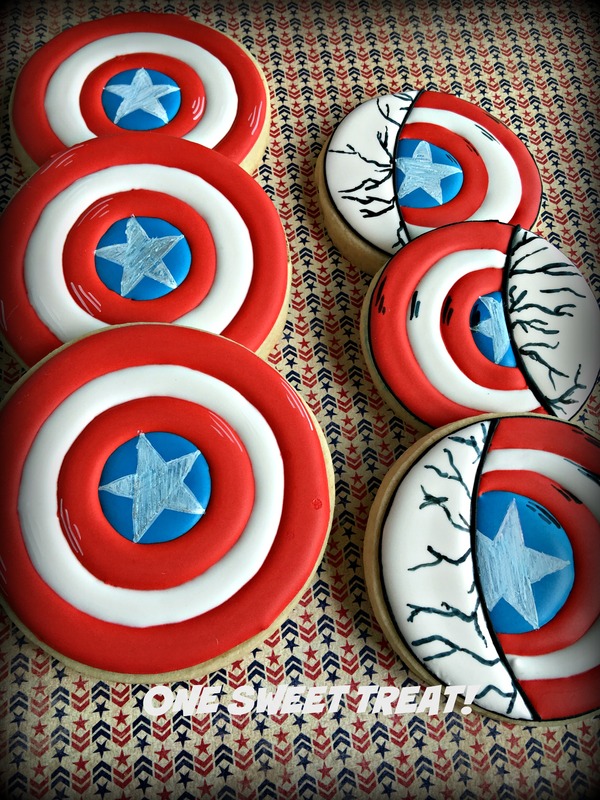 We also prepared sugar cookies for them. 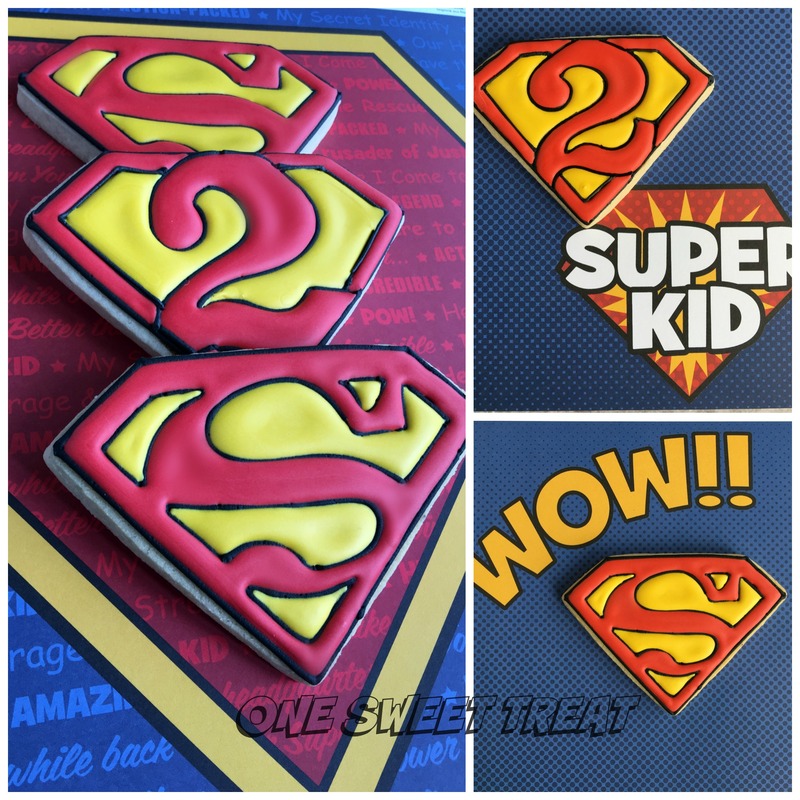 The images are made out of chocolate and placed on top of the cookie to give them a ‘dimensional’ look. 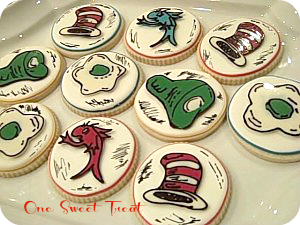 Some of the details on the cookies such as the black lines are made with an edible marker. These marks are very typical of the cartoons. 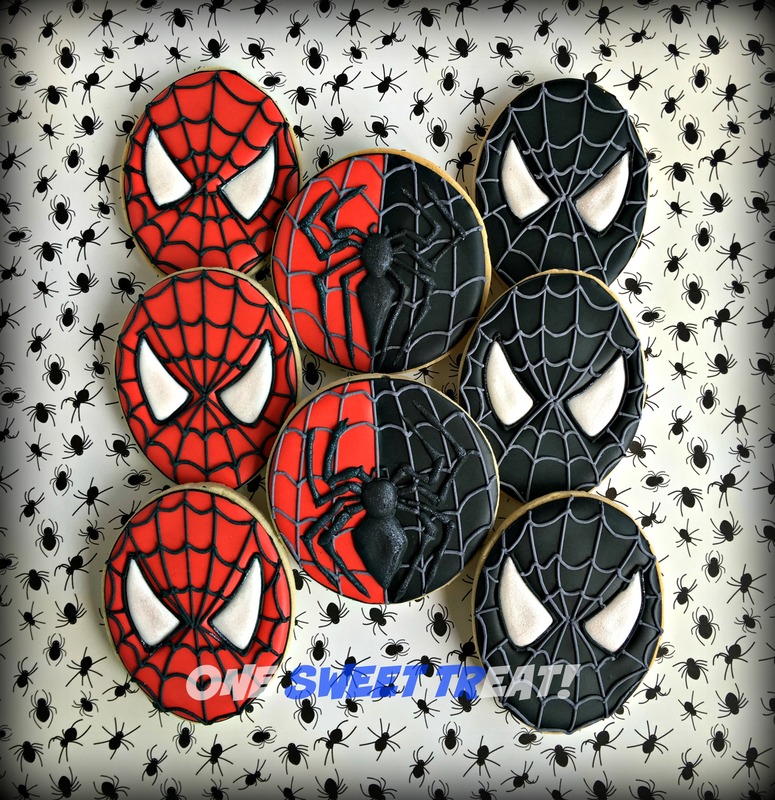 These cookies were designed to be party favors. 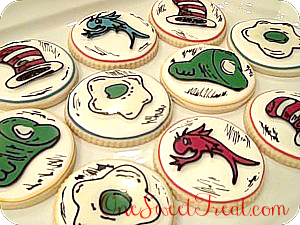 I’m sad to report that I forgot to take a picture of the actual Dr. Seuss cookie, I did actually make one or two. 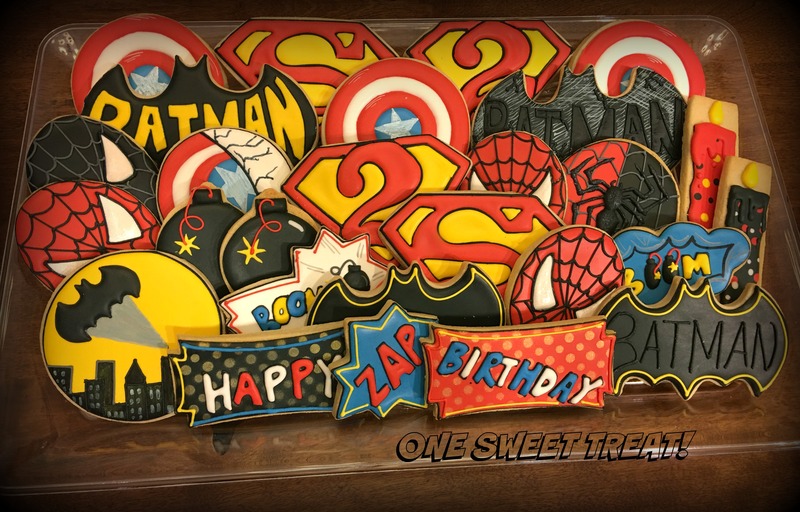 I think this set of cakes and cookies are some of my favorite ones ever. 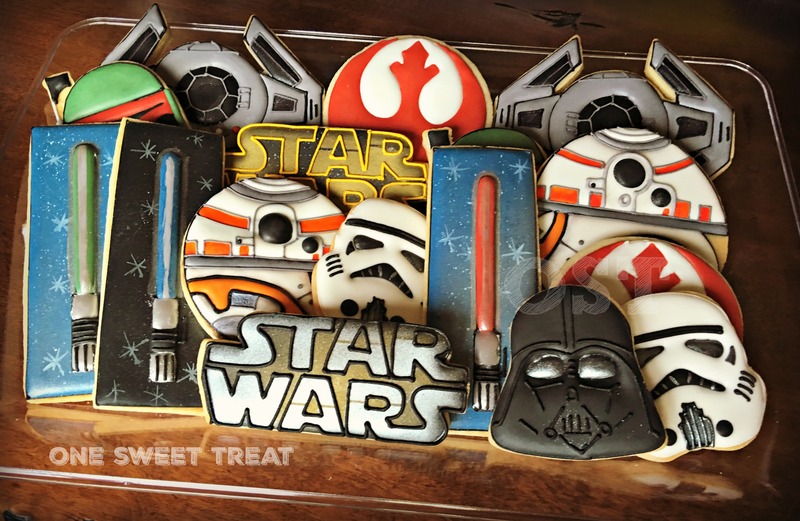 I love the fact that the chocolate pieces on the cookies look actually alive (! ? !). 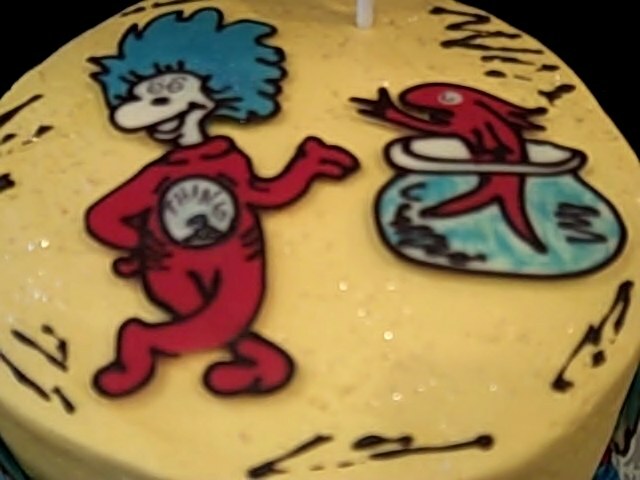 I am doing a Dr. Suess baby party for my new granddaughter. 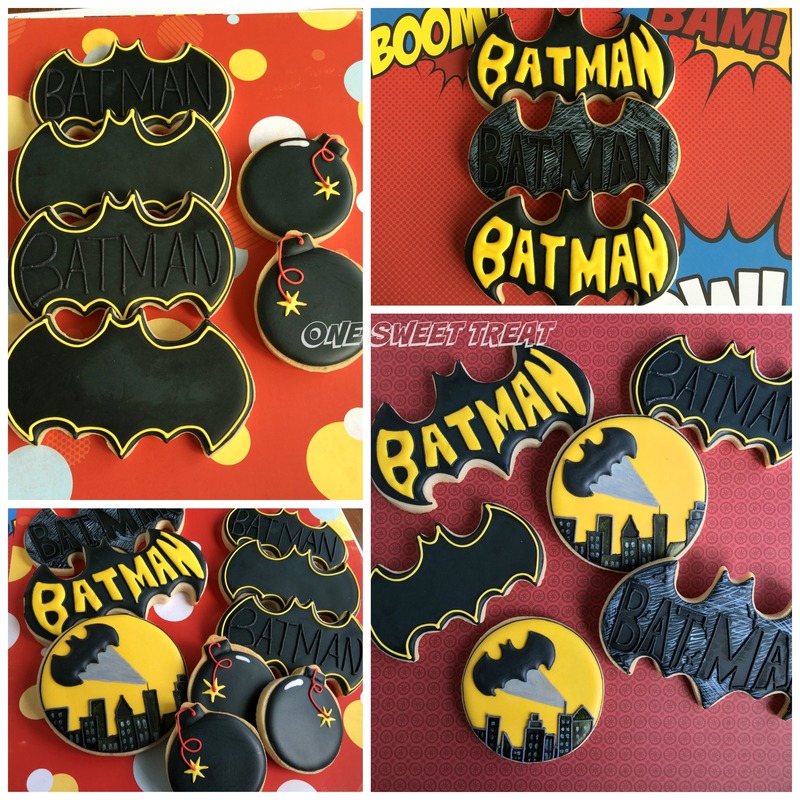 Would you share how you did the chocolate decorations? Did you pipe them, then paint them? Yours are fabulous! Thanks! 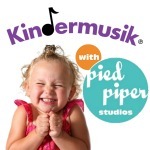 Thank you very much for visiting my site. 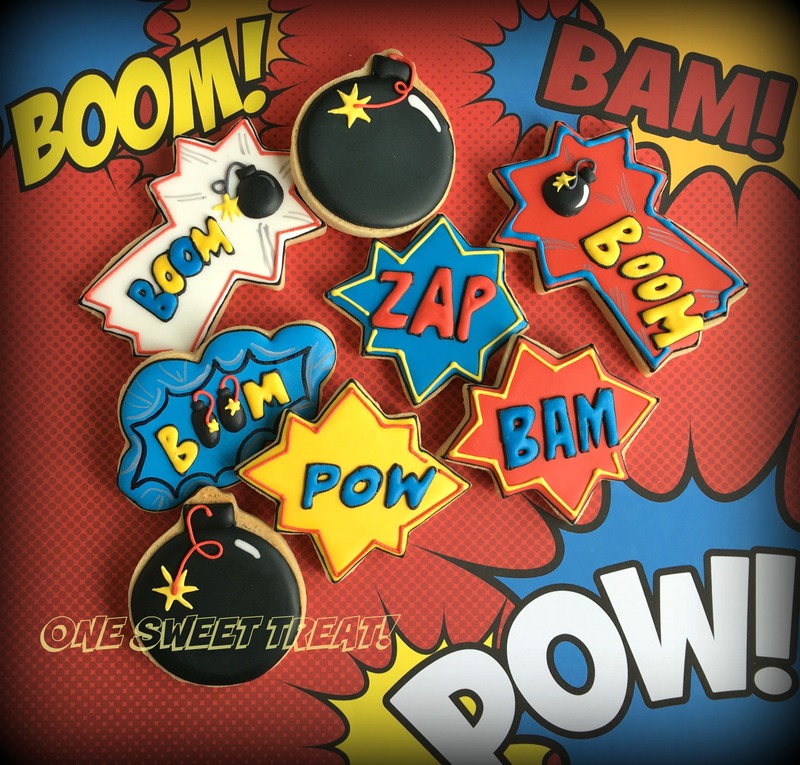 I do make all of my chocolate images. They are very labor intensive and a single piece can take me about 1/2 hr to finish. I have been working with chocolate for many years so I can’t really explain in a few sentences. A lot of people ask me if I can ship them separately, but they are very fragile and can easily break. In a near future I may put together a tutorial with tips on how to work with chocolate. Thanks again for your interest and time! 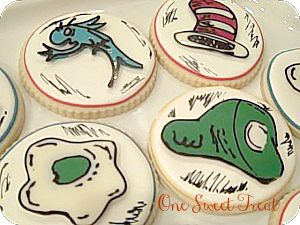 can I order the cat in hat cookies? How much for 15?